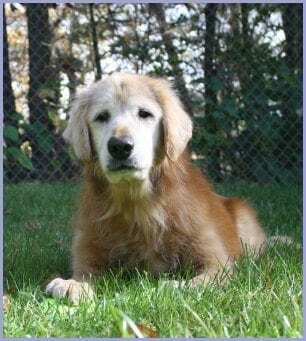 Odie #5173 - Yankee Golden Retriever Rescue, Inc.
Odie was 8 when his family could no longer provide for all his medical needs. The family had diligently tried to care for Odie’s allergies and constant barrage of skin and ear infections, but they had a child whose medical needs also had to be met. The financial strain became too much. 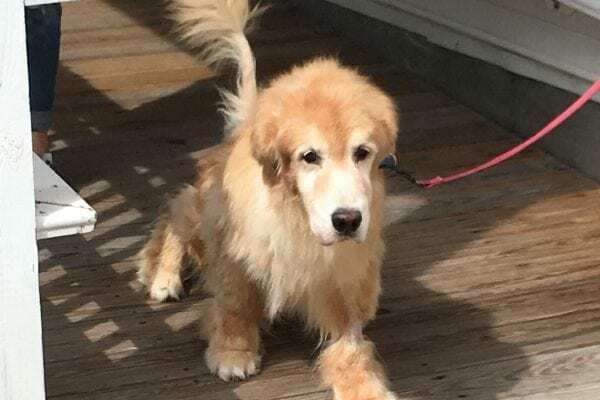 Knowing that Odie would require vigilance and ongoing care for his severe allergies, his family decided that YGRR would be able to give Odie the care he needed and find him the perfect new home. Odie arrived at our vet hospital and was started on medications to get his current infections under control. Odie also had an underactive thyroid gland, which often contributes to skin conditions. He was placed on medication to correct his imbalance. He was very itchy and he had to wear an Elizabethan collar until his hot spots were better to keep him from chewing at them. Odie was a very good-natured boy, however, and he was very cooperative throughout his stay at Riverview. In fact, he would wag his tail in anticipation of his eye drops being administered because he knew he would get rewarded afterwards! He was a very smart and happy boy. It was very gratifying for staff and volunteers to see the improvement in Odie’s health over time. This improvement most dramatically showed up in his coat. Odie went from having a very sparse coat with barely any hair to having a beautiful, thick Golden coat. Odie was a very playful boy. He was energetic and up for any adventure. He loved to explore the woods with the volunteers. He also loved toys, especially balls and toys with lots of squeakers. In the home simulation room, Odie would grab a toy and bring it up on the couch. He would also place a toy right next to you, hoping to get you to throw it for him. Odie also liked to practice his tricks, mastering the high five with enthusiasm! Once our vet deemed Odie’s conditions sufficiently under control, it was finally time for him to go to his forever home. Repeat adopters were undeterred by Odie’s condition and were dedicated to giving him whatever care he will require. They said they wanted a playful dog, and that is certainly what they got! Odie is settling into his new home and is loving all the attention he gets. His adopters anticipated that Odie might be a bit nervous in the car since he frequently went to the vet, but Odie seemed relaxed and slept most of the way home. Once in his new house, it didn’t take Odie long to make himself at home. He immediately hopped up on the bed and loved getting lots of attention. Odie carries toys around with him everywhere, which is no surprise. He is trying very hard to patiently sit and wait for things he wants – a very hard thing for a dog with as much zest for life as Odie! Odie loves having his very own family once again, and Odie’s new family loves their funny, spunky boy! Odie thanks you for your support. Odie required a long stay at Riverview before he was sufficiently on the right track with his allergies. He then required a very capable home that would be able to stay on top of his health issues so he can always enjoy life to the fullest. This level of care is possible thanks to your generosity to the dogs in need. Odie and all the Rescue dogs thank you and send big wags and kisses your way!